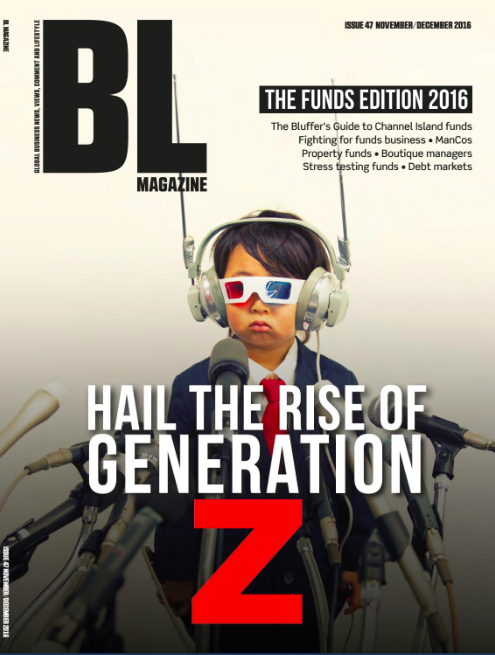 BL Magazine, November 2016. Original article p76-78. 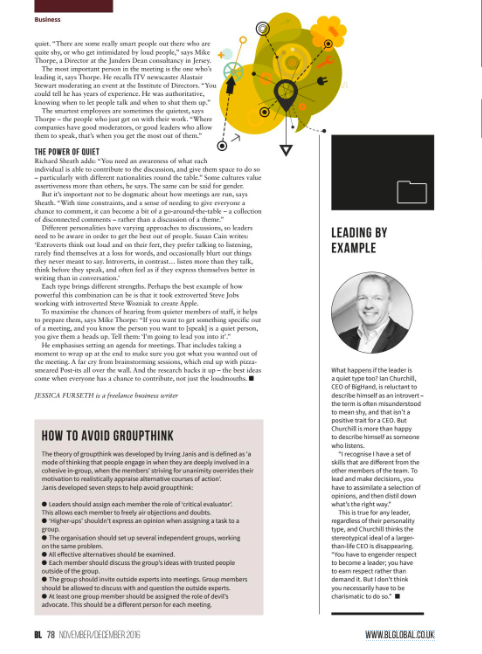 Everyone is prone to groupthink – even the boss. There are better ways for truly getting the best ideas out of people, because true innovation is often borne out of moments of quiet. If you want your team to solve a problem, lock them in a room with a whiteboard and a pizza and don’t let them out until they have something – that’s the conventional wisdom. Brainstorming remains a go-to method for inspiring new thinking, and it sounds great: by creating a relaxed environment, people can throw ideas around and see what sticks. Except there’s a problem: brainstorming isn’t actually all that effective. It’s a blow to companies that see themselves as dynamic operations where everyone’s always available, but there’s a myriad of research on this topic that argues for the opposite approach: give people some quiet! And only then, after some alone time, put them together to share their ideas. 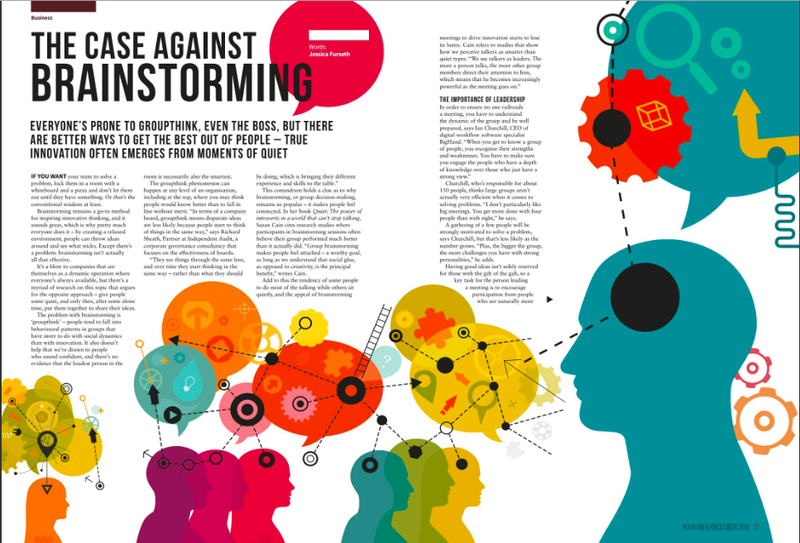 The problem with brainstorming is groupthink: people tend to fall into behavioural patterns in groups that have more to do with social dynamics than with innovation. It also doesn’t help that we’re drawn to people who sound confident, and there’s no evidence that the loudest person in the room is also the smartest. Having good ideas is not solely reserved for those with the gift of the gab, so a key task for the person leading a meeting is to encourage participation from people who’re naturally more quiet. “There are some really smart people out there who’re quite shy, or who get intimidated by loud people,” says Mike Thorpe, now a director of the Janders Dean consultancy in Jersey after eight years with Ogier Fiduciary Services. As different personality types have varying approaches to discussions, leaders need to be aware in order to get the best out of people. “Extroverts think out loud and on their feet, they prefer talking to listening, rarely find themselves at a loss for words, and occasionally blurt out things they never meant to say,” writes Susan Cain. “Introverts, in contrast, … listen more than they talk, think before they speak, and often feel as if they express themselves better in writing than in conversation.” Each type bring different strengths: perhaps the best example of how powerful this combination can be is how it took extroverted Steve Jobs working with introverted Steve Wozniak to create Apple. To maximise the chances of hearing also from the quieter members of staff, it helps to prepare them, says Mike Thorpe: “If you want to get something specific out of a meeting, and you know the person you need to [speak] is a quiet person, you give them a heads up. … Tell them, ‘I’m going to lead you into it.’” Thorpe emphasises the importance of setting an agenda for meetings: why are we doing this? That includes taking a moment to wrap up at the end, and make sure you got what you wanted out the meeting. This is the opposite of brainstorming sessions that end up with pizza-smeared post-its all over the walls, but the research backs it up: the best ideas come when everyone has a chance to contribute, not just the loudmouths. Posted on 10/31/2016 by Jess. This entry was posted in Business features. Bookmark the permalink.